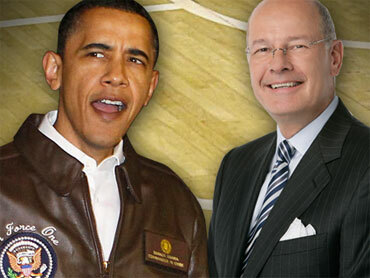 "Early Show," co-anchor Harry Smith goes head-to-head with President Barack Obama, both on and off the White House basketball court. Smith's interview and clips from the game will air on Friday's broadcast. CBS Sports' lead college basketball analyst, Clark Kellogg, also shot hoops with the president and conducted an interview. Kellogg's interview with the President, and the entire game, will be broadcast on Saturday, April 3, during CBS Sports' exclusive live coverage of the 2010 NCAA Final Four.